It looks like my breakfasts posts are coming one on top of the other lately. After a long, breakfast-free, interval, they seem to be back with a vengeance…reclaiming their rightful place as this blog’s namesake. That past two breakfasts have been hearty…a fortifying rice meal, and a rich & sweet rice pudding. Although both able to give a proper amount of valor to face the trials and tribulations of gloomy work days during the rainy season, both are also liable to pile on the poundage if eaten unchecked, day after day. Here is something much lighter, but equally yummy, and as you will see, no less special. Many people eat yogurt for breakfast…some can’t live without it; some just eat it just for the sake of promised weight loss. I am living gloriously in the former category. I love yogurt. It can put me in a good mood like nobody’s business. And since I’ve discovered a good, thick, natural yogurt sold in my grocery (read more about it here), I have been enjoying it in every way I can. Here’s one of them. – Place wine, water, and sugar in a saucepan and heat until sugar is dissolved. – Add the cinnamon stick and orange rind and let infuse for a couple of minutes. – Add the nectarines and poach gently for 5-10 minutes, until just tender. – Top a bowl of yogurt with some of the slices and a drizzle of the poaching liquid. Sprinkle some pistachios on top for added flavor and texture. – Store the rest of the poached nectarines with the poaching liquid in a jar in the fridge. Use as topping for yogurt, ice cream, a filling for crepes, perhaps in a tart…lots of possibilities! 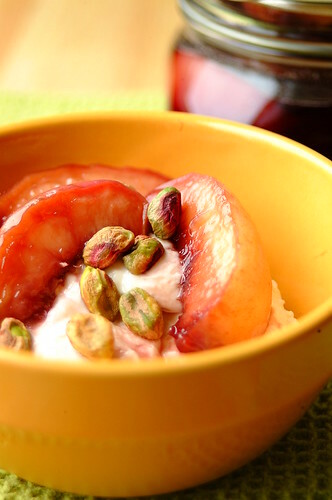 was looking for a poached nectarine dish and found this….and as i had some red wine at home, decided to make it…we had it for dessert with streets blue ribbon ice cream…omg so good!!! thanks so much…so easy…so yum!